The play area in Down Lane Park is as it exists now, badly needing repair and renovation. It has a limited number of play facilities. Our campaigning is beginning to pay off. Haringey Parks Development are optimistic that we will receive the funding of £400,000 for the new play area. This money can supply an excellent new playground for Down Lane Park. It will comprise a play area with modern equipment and additionally a natural play area. We are all proceeding on the basis that this funding will be available for next year. 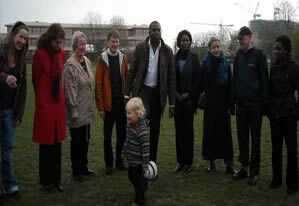 David Lammy MP on visit to Park. We are working with Jan Wilson, Senior Officer Parks Development to design the new play area. Final design is scheduled to be completed by early February 2010 and work is projected to start on site in July 2010 and complete before March 2011. The Green Link is going to be designed to cross the existing play area. The design will be started sometime in future but not in time for the designers of the play area to know what space it will leave. The uncertainty will mean that the play area design could be significantly delayed or limited in size and shape in any case.